State of Diplomacy: What will it take? What is Iran’s standing in the world in 2013 compared to the beginning of 2012? · Tehran did not yield to new sanctions, despite the fact that oil and gas export revenues had dropped 45 percent in the last nine months of 2012, according to a parliamentarian and an oil ministry report. 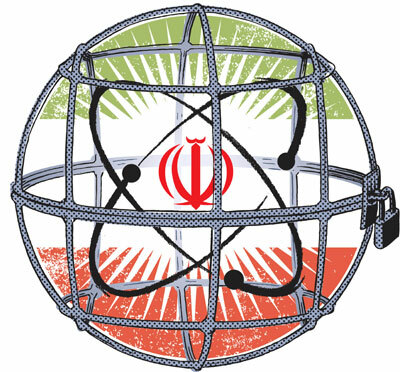 · Iran also refused to comply with U.N. nuclear watchdog. In January 2012, the International Atomic Energy Agency (IAEA) reported that Tehran had begun enriching uranium to 20 percent, a step closer to weapon-grade fuel. Tehran also refused IAEA calls for access to documents, scientists and key sites like the Parchin military testing ground to answer questions about alleged nuclear weapons work. · Tehran openly signaled to its Arab neighbors and the West that it was strengthening its military capabilities. Iran claimed to have captured a U.S.-made miniature surveillance drone in November 2012, after bringing down another in August 2011. It also carried out wide-ranging military exercises in the Strait of Hormuz at the end of 2012. · Iran weathered Israeli warning of a possible military strike. By the end of 2012, Israel backed off talk of targeting Iranian nuclear installations. Israeli Prime Minister Benjamin Netanyahu yielded to President Barak Obama’s insistence that diplomacy could still resolve the crisis over Iran’s controversial nuclear program. · On the diplomatic front, the Islamic Republic made no concessions in three rounds of high-level talks with the United States and five other world powers —the so-called P5+1— including Britain, China, France, Germany and Russia. It also hosted the 16th Non-Aligned Movement summit in August 2012, in turn marshaling international support. · The United States imposed new sanctions on Iran. In February, President Obama signed an executive order freezing the property of the Central Bank of Iran and other Iranian financial institutions. Additional penalties on foreign banks conducting financial transactions with Iran’s oil sector were imposed in June. In November, the Senate approved indirect sanctions on foreign financial institutions that did business with Iran’s energy and shipping sectors. · The European Union imposed new sanctions on Iran’s Central Bank and oil sales. In July, it banned the import, purchase and transport of Iranian crude oil. In October, it prohibited conducting business with Iranian banks and financial institutions unless specifically authorized. The 27-nation group also banned the import, purchase or transport of Iranian natural gas. · The world’s six major powers remained united during three rounds of talks with Iran in Istanbul, Baghdad and Moscow. They demanded that Iran cease enriching uranium to 20 percent. Despite differences, China and Russia did not break ranks from the so-called P5+1. What new information about Iran’s nuclear program was revealed in 2012? Iran actually disclosed some new information about its program. It revealed that it was enriching uranium to 20 percent of the U-235 isotope, up from the 3.5 percent needed to fuel for power reactors. Tehran claimed that higher enriched uranium was for a research reactor making isotopes for medical diagnosis. But 20 percent enriched uranium is also closer to weapons-grade uranium, which is enriched to over 90 percent. But the international community provided more important data. In November, a U.N. report outlined alleged nuclear weapons-related work by Iran. It named Iranian organizations that had worked on an explosive device for a nuclear weapon before 2003, the year it suspended its weapons program. The experiments were believed to have been conducted at the Parchin military testing ground. Iran has refused to let the IAEA inspect this site. The IAEA report also showed how Iran may have continued its weaponization efforts after 2003, by dispersing the main organizations doing this work into smaller units and renaming them. The IAEA also found that 644 new centrifuges were installed at Fordow, the mountain facility near the religious city of Qom, and 991 centrifuges at the Natanz nuclear facility between August and November. Iran is poised to radically increase the pace of its uranium production once the centrifuges are fully operational. What are the expectations for international diplomacy with Iran—either with the world’s major powers or unilaterally with the United States—in 2013? Iran is under a lot more pressure than in the beginning of 2012, mainly from U.S. and E.U. sanctions cutting into its oil sales and its ability to do business internationally. Last year, the value of Iran’s currency, the rial, plummeted by at least 50 percent, with some unofficial estimates claiming by up to 80 percent. In October, bazaar merchants, an important business class, launched a rare protest over the devaluation. The U.S. strategy is to tighten financial sanctions to push Iran into meaningful negotiations. For now, however, Iran is widely estimated to have enough foreign reserves to finance its budget and keep the economy from collapsing, despite both domestic and international pressures. And, in the beginning of 2013, neither Israel nor the United States has used language about the military option.